Beechcraft has always made bespoke aeroplanes for corporate cheeses and after World War Two the aeroplane by which all others were measured was the lovely Twin Beech. Powered by a pair of Pratt and Whitney R985 Wasp Junior radial engines, this seemingly ancient but well respected World War Two throwback endured until 1970, even after Beechcraft introduced the first King Air 90 in 1964, itself a development of the Queen Air. The Beech 18 saw considerable change throughout its life. Not only were its basic cabin dimensions changed, the aircraft underwent a mod program to provide a nosewheel undercarriage, which begat a fuselage stretch to accommodate more passengers. Whilst most modifications were devised by outside companies, Beechcraft followed a similar course with its Queen Air including a definitive name change when it installed a pair of Pratt and Whitney of Canada PT6 turbines into what was to become an industry yardstick. Whilst the King Air underwent a number of engine upgrades, it morphed into first the Beech 99 regional airliner and then the model-100 and model 200 and its outgrowths. The unpressurised Model-99 maintained Beech's tradition of providing a small airliner version of its business turboprop. The 15-passenger Beech 99 was essentially a Queen Air derivative, using the piston twin's wing but with King Air engines and nacelles. The first one flew in 1966 and the last in 1986 after 239 were built. Beech had capacity to make 100 99s a year and indeed they hoped they could reach this figure with the US's expanding network of regional commuter airlines. Whilst numbers never matched Beechcraft's aspirations, the Model-99 also became popular amongst small freight companies and with this in mind Beech developed a highly stretched King Air they called the 1900. First to appear was the straight 1900 with a pair of airstair doors and a small cargo door close to the tail. Only three 1900s were made and only one went into service; with the Bolivian defence force. With two passenger doors unnecessary, Beechcraft installed an enlarged cargo door in place of the rear airstair and called it the 1900C. It was powered by a pair of Pratt and Whitney of Canada PT6A-65B engines flat rated at 1,100 shaft horsepower. 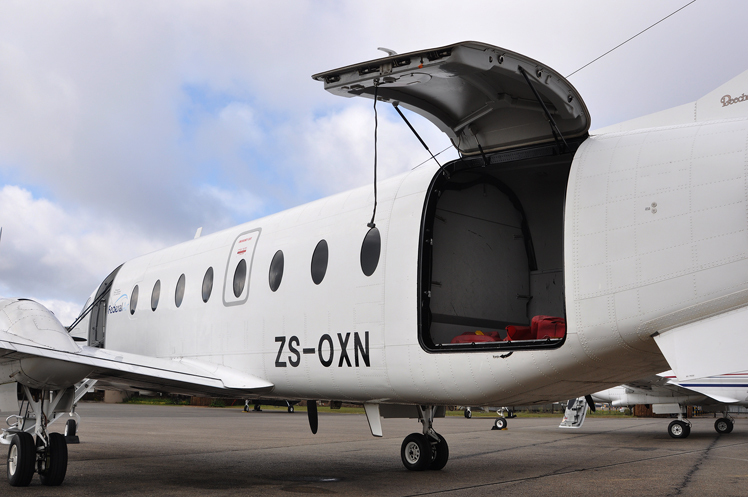 The aircraft was certified to carry up to 19 passengers and a total of 248 'C's were made. The first 1900 was delivered in 1984 and Beechcraft went on to build 439 high-cabin 1900Ds up to the last one delivered in 2002. The early eighties were a fertile period for new start-up airlines following the 1978 Airline Deregulation Act in the USA. The operators all wanted aeroplanes that would feed larger hubs from outlying communities and a number of manufacturers answered this call. The burgeoning regional airlines expanded rapidly and like a passing fashion, many of the twin-engined turboprops became too small and were replaced by regional jets. 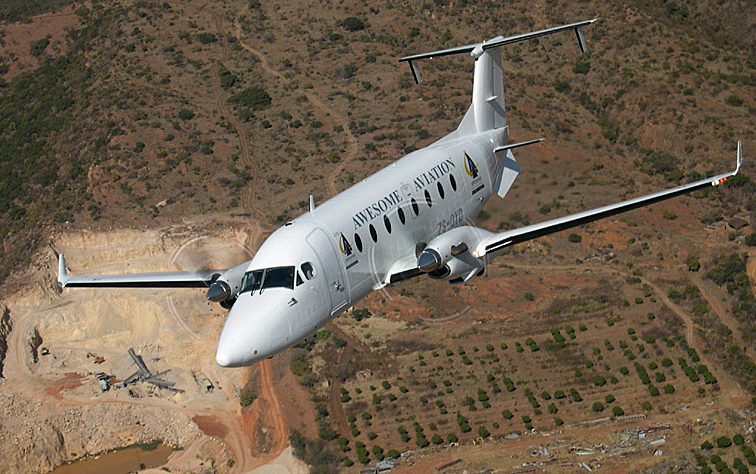 With twin turbines falling out of favour, Beech 1900s began to flood the used market and they proved ideal for an equally growing contract industry used in support of various non-government agencies and corporates wanting to transport personnel between major airports and remote airstrips. Beechcraft's venerable King air has found huge favour, not just amongst US-based corporate operators, but also with the global charter industry. 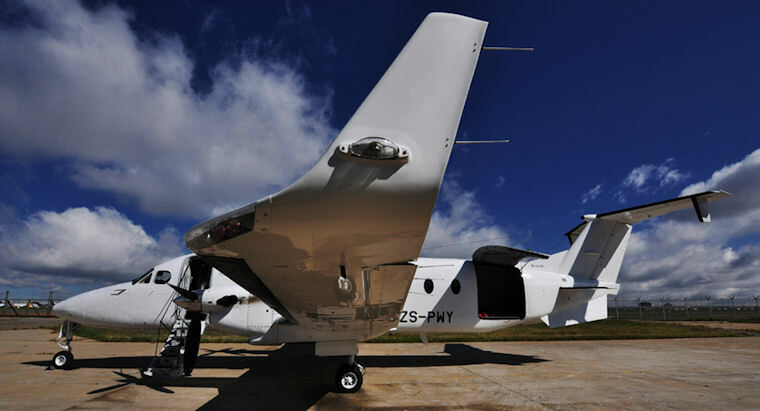 The aeroplane's solid qualities of being able to operate from short and rough airstrips and having a useful range of at least 1000 nautical miles, has made it the darling of both the private and corporate charter and contracting industry. It was with little surprise therefore that, suddenly unloved by many regional airlines, the 1900D with its built-in King Air qualities quickly found favour in other parts of the world. Turning a standard King Air into a 1900 was not a straightforward task. For one thing, the extra fuselage length determined a far wider C of G envelope and managing the stretch meant complying with some stringent standards to maintain longitudinal stability. Beechcraft were at the same time mindful that the ultimate market for the new mini airliner was limited and thus wanted to minimise development costs. One way of meeting that need was to use the King Air 350's wing - at least in terms of plan form. 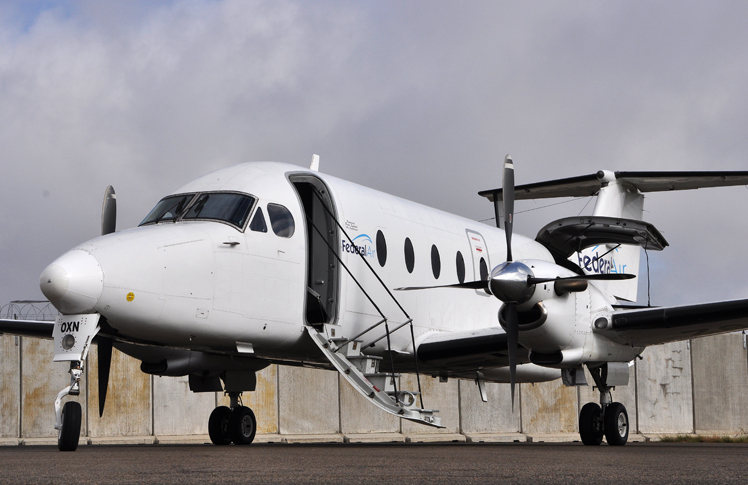 The 1900D's wing is a single-spar version of the King Air's three-section assembly and has a six-foot overall greater span over the 1900C as well as a pair of winglets. To embrace the considerably extended centre of gravity envelope, Beechcraft had to provide greater wetted area to maintain pitch and yaw stability and this they did by adding small fins on the underside of the high horizontal stabiliser and an extra - mini-horizontal stabiliser attached to the rear fuselage. A pair of strakes were added to the underside of the rear empennage to help kick the tail up in the event of an aft C of G stall and to ease the requirement for a yaw damper. The overall impression is an un-King Air rear-fuselage section that has taken on the character of an aerial porcupine. Unlike the 1900C, the 1900D was certified to a higher FAR Part 23, 'Commuter Airliner' standard, although a superficial comparison of the two types reveals few technical differences. A look under the skin however, reveals some changes, which included a revised trim installation, upgraded ice protection and most significantly, a collection of airframe enhancements designed to meet FAR Part 23's very much higher structural integrity standards for this class of aircraft. One of the improvements however, is the 1900D's significantly more powerful engines; a pair of flat-rated Pratt and Whitney PT6A-67Ds pushing out 1,279 shaft horsepower. The greater power does good things for performance, it provides the 1900D with useful hot and high numbers as it produces its rated power all the way to 8000 feet. Indeed, the 1900D could almost be described as being overpowered and it only takes a quick look at the POH to see where the airplane really scores; take-off performance comfortably exceeds the 1900C model and the D's single engine ceiling is an impressive 17,000 feet. Entry to the 1900D is via a forward airstair door. At the back is a wide cargo door and in between a layout that normally includes 18 seats with a moveable lightweight bulkhead separating the cargo area. Despite the taller passenger windows and higher roof, the interior still shares the tunnel-like appearance of the lower-roofed 1900C model. However, being able to get up and walk around, although obviously discouraged in a commuter aircraft, does at least give the appearance of a somewhat larger aircraft. There are no overhead lockers and all luggage is either placed at the back or stored in a small alcove at the front and opposite the entry door. At the fifth row of seats, the wing's hefty spar passes through the cabin to provide an easily missed obstacle for passengers to trip over. In many commuter 1900s however, the operator installed a small ramp each side of the spar. Interior layouts varied and whilst some 1900s were configured to carry 19 passengers, others were supplied with 18 seats and a rear toilet just aft of the rear cabin bulkhead. Some aircraft were outfitted as medivac airplanes with seats removed from one side and replaced by stretchers and some were simply used as cargo aircraft with no passenger seats at all. The front end however, is familiar to any King Air pilot. The 1900 appeared as glass cockpit fashion was accelerating and whilst the Collins equipment provides for a two-tube AH and flight director combination each side, almost everything else is analog, including the engine gauges, avionics and other primary dials like the airspeed indicator, altimeter, VSI and RMI. There's little doubt that cost was a primary factor as well as the swiftly developing market for regional turboprops. Trying to install the latest equipment might have delayed certification and thus a good number of orders from opportunistic operators. Those used to their King Airs will also be reassured by the traditional fuel gauge 'binnacle' on the left as well as the overhead panel and centre console containing all the avionic remotes. With the heightened roof, entry into the front seats is easier, although it still requires minor contortions to step over the centre stack. There is a handle set into the roof in an attempt to make the job easier but less agile crew might still be huffing and puffing by the time they have settled into their thrones. There's nothing unusual about the start process. The right engine, because it is on the opposite side to the door, is normally started first. The battery is also located in the right hand nacelle and so the electrical current has less resistance to start the number two engines. Thumbing the right ignition and start switch gets the propeller turning, confirmed by the first officer as it's out of sight to the lefthand seat occupant. At 15-per cent, the fuel lever is fully advanced and the ITT and N1 turbine rpm is monitored to watch for a hung or hot start. The limit is 1000�C, which will be rarely approached with a healthy battery, even on a hot day. With a quick check to make sure the fuel and oil low pressure annunciators are off and the right engine oil pressure is rising, the right generator can be brought online. With the right engine stabilised, the exercise is repeated for the left. The checklist calls for, amongst other items, Yaw Damper engagement or 'as required'. This supports Beechcraft's efforts to make the 1900 relatively snag free as far as the Minimum Equipment List (MEL) is concerned. The yaw damper is not a no-go item and this lends some justification for the myriad extra flying surfaces sprouting from the tail area. The airplane also has a substantially lower ceiling than a regular King Air 200-series or 300-series - in the 1900D's case, 25,000 feet compared to a B200's of 35,000. King Air pilots will know their aircraft are sloppy to hand fly at much above the mid-twenties so their yaw dampers (and autopilots) are essential. Unsurprisingly for a commuter, an autopilot is a Beech 1900 optional extra. With everything set, including arming the auto-feather function, taxying the 1900 is simplicity itself. The propeller levers are set to the ground fine detent and thrust is varied by altering the pitch. The nosewheel has a two-position steering facility that enables the airplane to easily turn within the length of the fuselage. This is a tremendous help in negotiating the crowded ramps or narrow parking areas found at many developing country airstrips. There's not a great deal to do prior to lining up other than flicking on the pitot heat and landing lights and running a final check of the fuel quantity. With the throttle at idle, the propeller lever is moved to the high rpm position and the elevator trim is set followed by the usual full and free control movement check. Flap deployment is very much a personal preference. Adding first position reduces the take-off roll slightly but has a negative effect on the one-engine-out climb gradient. Most pilots will opt to leave the flaps in the fully stowed position, especially when departing close to gross weight. With the power levers set to 39000 lbs of torque (under most conditions), acceleration, even at higher weights, has an unleashed quality. The 1900D rushes to its 100 knot rotation speed with little drama and with a firm pull on the control column, the airplane rotated to an impressive nose-up attitude as the Beechcraft clawed for height at well over 3500 feet per minute. At higher weights the rotation speed will be around 112 knots. The 1900D is somewhat heavier than a standard King Air and this is to be expected considering its greater bulk and longer control runs. In the low twenty flight levels, the airplane will easily break the psychological 250-knot cruise number, and settle comfortably at around 260-plus knots burning some 700-750 pounds of Jet A1 an hour. Pilots will get used to flying the 1900 at a 10,000 feet cabin altitude and it's here that the relatively low ceiling is perhaps explained. The 1900D has a cabin almost five times the volume of a standard King Air and by design the fuselage is intrinsically shaped to offer less strength to containing a pressurised body of air. It only takes one look at the tall fuselage sides to see this. Consequently, the pressure differential is a modest 4.5lbs. The cabin pressurisation system has long been considered a 1900 weakness, especially as it's commuter role requires quick climbs and relatively steep descents. This places a high workload on the pair of standard outflow valves. The aircraft is pleasant to fly at slower approach speeds. Whilst requiring slightly higher speeds than a standard King Air, the 1900 is considered kindly to land. The pitch trim tabs are predictably larger than a Beech 200 and work well in easing the control forces after flap deployment. Most pilots will be looking for an initial descent speed of 180 knots until established on the ILS, where the speed can then be reduced to 150-knots. Below 188 knots, first stage flaps (17-degrees) can be dropped. Below 154, full flaps can be selected and the speed bled back to 130 knots for the gear. The target final approach speed is between 110 and 115 knots depending on weight and by the time the aircraft crosses the threshold the touchdown speed should be just under 100 knots with a small flare and the power levers pulled back to flight idle ready for reverse. Indeed, the large composite propellers have a significant braking effect during touchdown. Like most other aircraft, nailing the approach speed correctly is the key to undramatic arrivals and the 1900D's benign manners help tremendously in contributing to comfortable arrivals. 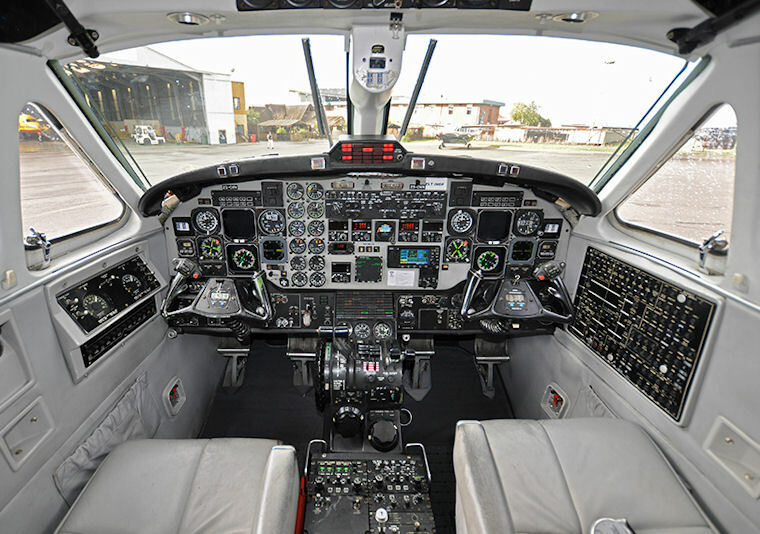 As many King Air Pilots have discovered, the move to the 1900 is mostly stress free. The aircraft looks like a King Air and flies like one. There are areas where sizing up has led to arguable compromises - one of them being the gas strut operated cargo door, which is a structural item when closed but seems insubstantial when closing it requires pulling down on a length of cord. In almost every respect, the 1900D has responded well to that well-travelled improvement path of simply adding far bigger engines and making everything else equally large. This tall-roofed commuter liner still has many years of popular use from cost conscious contracting companies and occasional corporate flight departments as well as the few regional airlines still operating the type.